I would use this with my kinder and early elementary and lower level kids. Love all your giveaways! This would be fun to use with my little guys. I would use it for following directions from simple to complex, describing, sorting, spatial concepts…the possibilities are endless. I would use these with my lower el students or lower functioning students. I would use this with my special education kindergarteners! Looks like a great activity for the little ones! I would use this with my preschoolers!!! I would use this with my son!! For numerous activities too! He has a problem classifying anything really, and this would come in handy for wh question activities and all around great in games that would help with receptive communication skills and maybe help work on his attention problems! I would use this with SO SO many 4th graders! I would use this with my preschoolers and younger students for all the listed activities, but I would also set up an “apple picking” activity in my room (like a treasure hunt) and for following directions and locative concepts “put the biggest apple under table, etc.” Very cute gross motor activity from your session. This would be great with my preschool group for basic vocab, motor, phrases/sentences expansion, etc. & great with my KN groups for categorizing, comparing/contrasting & sentence formulation! I would use them with my preschool, kindergarten and autism students. I would use these with my preschoolers, my students with cognitive disabilities, autism, and students with delays in concept learning. All levels–for the varying complexity. My language impaired kindergarteners would love this! This is great! I would for sure use it with my pre-k kiddos! I am new to the field and work with K-8. I see many uses for this -compare/contrast, following directions, and answering wh questions. BTW, love this blog. It is so helpful. I would love to use this with my preschool kids to target language. I would use this with my language delayed kids. I would use these with my language students. The possibilities are endless. You could do a great apple theme with categories, spatial concepts, sequencing (make applesauce), read Dr. Seuss 10 Apples Up on Top. I would use this with my language students, students with autism, and just about any kiddo on my caseload! Thanks for the opportunity! I would use this activity with my elementary case load! 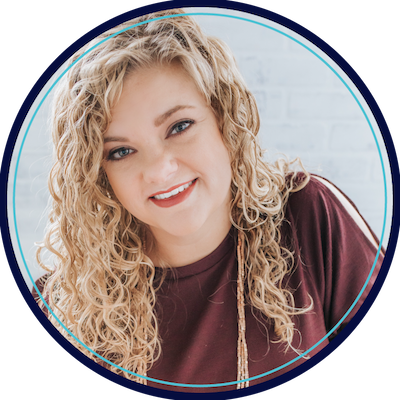 As a new CF, I don’t quite know who I will have on that caseload this upcoming year, but I can see this tool being so flexible that I could use it with a variety of students! My preschool and early elementary language students. Oh man! I would use this w/soooo many of my kiddos! Perfect for fall vocabulary, for sure! I have a group of kinders I would love to use this with! I would use these with my preschoolers. Just landed a speech position working with preschool through first grade! This would make a nice addition to my collections. I service 30+ students with Autism and I ALWAYS have lots of attributes and comparison goal! This would be a great hands on activity for them! I would use these with preschool and elementary kids with language goals. I would use these with my kindergarten and first grade students to address language formulation goals. I would be using the ATTRIBUTE APPLES with my son. He has down syndrome and is also autistic. He learns well with concrete objects and manipulation of those objects. I would use these with my students to target language goals related to categorizing, concepts, and attributes! I would use this activity with my young students, of course…but I would also use them with my older students who have severe cognitive disabilities to do vocational activities like sorting, and language activities. Ooh, I can think of so many ways to use this!!! Soooooo many ways this could be used for my elementary school caseload! It’s so fun to be able to incorporate it into themes, too…perfect for Back to School! Thanks for the opportunity to join the giveaway! This activity can really be used for so many things…size concepts, colors, sorting, patterns, counting…so many great language/pre-academic tasks!!!! I like it! Cute activity! The majority of my caseload consists of preschool age students. They would love this game! This would be great for AVT! I need these in my arsenal. This would be great for my preschool and kindergarten kiddos!! I would use the apples with my preschool kiddos and students working at functional academic level. These would be great to use with all my students! I did an apple theme 2 years ago and my students are always asking about more apple activities. I’d use them to with my 1st & 2nd graders for describing and expressive skills! I am a teacher and I would use this activity to help the students in my classroom. Apples are a big thing with younger children andi teach 1-3 grade students with disabilities (Atisim) it is important to get as many resources as possible to support their education! I have lots of Kindergarten language students this year and they are all working on using descriptors so this would be great for them. I also work with students with Autism that I could use it with also! Thanks for all the give aways!! I work with preschoolers and would love to use this product! With fall coming up soon, I’d use this tool with my preschoolers and kindergarteners. One of the teachers I work with does a great unit on apples, where the kids describe them, taste them, and then write about their favorite variety. This tool would be a neat addition to that unit lesson. This would be a great activity to use with my preschoolers! I like to do an apple theme in the fall, so I would definitely use these. These are so awesome! Way better than the tupperware bowls we use for size difference now! Oh man, I would love to have this for my elementary school kids. I am taking over for a retiring SLP, and just saw my materials on Friday. I think some of them are as old as the 1951 building! I’d use these with my preschool and early elementary students. I’m also sure I’d be able to think of some way to use them with the older elementary students as well! Who doesn’t love apples! I’d use these with my preschoolers. First days of school have them so scared but this would be a great talking exercise and even a contest. I’m starting a new job this week working in the public school system. I’d love to use this for my preschool and kindergarten kids! I love using manipulatives in therapy! What a great idea for back to school themes!! This would be a perfect addition to help me start building my materials. I am new to speech and will be starting a new job doing in-home therapy. If I won this prize, I would help my 4 year old son learn more about problem solving skills. I would use this activity with most of the students on my elementary school caseload! I would love to be able to use these with my kids in the classroom. This is a great tool to use with the kiddos during speech. This would be a great activity for my younger students! This would be great for my preschoolers. 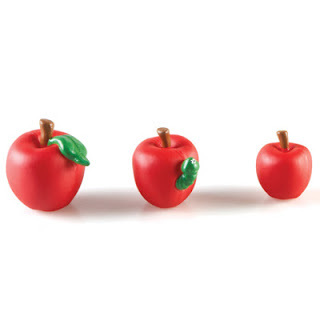 I would use these apples with my preschoolers in the fall season when the teachers are teaching their fall themes! I would use it in therapy with some of my younger students. They would love it! I would use this with my preschool and kindergarten students! I would use this activity with my preschoolers/kinders. You can create many different language activities..sorting, colors, describing, etc. It would be a great reinforcer during articulation practice too! I would love to use this with my elementary school students. Looks cool! I would love this to work with the new preschoolers I am getting in the fall! I think I would use it with preschoolers working on some of those basic concepts. Or it may also be a good way to help early elementary students start being more observant of attributes. 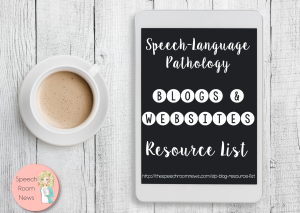 My daughter has apraxia of speech so we are always looking for fun ways to practice at home! As a recent graduate with my Master degree, (as of Saturday actually!!! ), I am even more excited to begin the career I have been working towards for over 6 years. 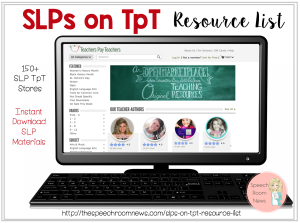 Being a new speech-language pathologist, I don’t yet have a great supply of materials to use. 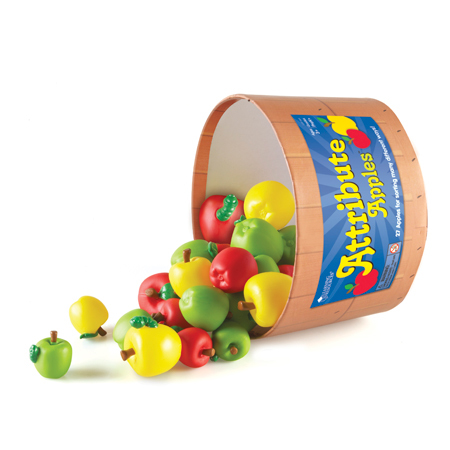 The ‘Attribute Apples’ would be a great asset to use with my preschool and school-age clients. I would love to have this set to use in our peds clinic…both the kids and I love fresh new materials!